A 1912 map of the Great Uprising of 1857 showing the centres of rebellion including the principal ones: Meerut, Delhi, Cawnpore (Kanpur), Lucknow, Jhansi, and Gwalior. Numerous actions by the East India Company led Indian troops to rebel. Troops were followed by public in many places. The Indian Rebellion of 1857 began as a mutiny of sepoys of British East India Company's army on May 10, 1857, in the town of Meerut, and soon erupted into other mutinies and civilian rebellions largely in the upper Gangetic plain and central India, with the major hostilities confined to the region of present-day Uttar Pradesh, Uttarakhand, northern Madhya Pradesh or Saugor and Nerbudda Territories, Delhi, and Gurgaon. Quote: "The 1857 rebellion was by and large confined to northern Indian Gangetic Plain and central India." The rebellion posed a considerable threat to British power in that region, contained only with the fall of Gwalior on June 20, 1858. The rebellion has also been termed India's First War of Independence, the Great Rebellion, the Indian Mutiny, the Revolt of 1857, and the Sepoy Mutiny. As with the American colonies, Britain began its presence in India by way of a chartered company. The Honourable East India Company had been granted rights by the Crown to conduct trade in India and establish treaties. The British government promised military protection of the East India Company. India had long suffered divisions between its Hindu, Moslem, Buddhist, and Jain populations. They lacked the blood and cultural ties with Britain that Americans had. In India's case, they faced a foreign invader in Great Britain, not a civil war. The Indian Rebellion of 1857 marked an uprising against a hostile foreign nation rather than a rebellion against a brother. The Indian Rebellion of 1857 marked a turning point for Britain in India. Prior to the uprising against the British, the British East India Company governed British affairs in India. The British army and navy supported the East India Company while the governors of the company ruled British possessions in India. After the nearly disastrous for British interests rebellion in India, the British crown assumed direct control over affairs in India through the Governor General or Raj. India became a colony directly under control of the British crown, much as the American colonies had been. Several months of increasing tension preceded the actual rebellion. Fires broke out near Calcutta on January 24, 1857. On February 26, 1857 the 19th Bengal Native Infantry (BNI) regiment heard a rumor that new cartridges had a casing made of cow and pig fat, which had to be bitten off by mouth. The cow being sacred to Hindus and pig haram to Muslims, soldiers refused to use them. The British had a tense confrontation with the soldiers before standing down. On March 29, 1857 at the Barrackpore (now Barrackpur) parade ground, near Calcutta (now Kolkata), 29-year-old Mangal Pandey of the 34th BNI rebelled against his commanders. When his adjutant Lt. Baugh came out to investigate the unrest, Pandey opened fire, hitting his horse. General John Hearsey ordered a Jemadar Ishwari Prasad to arrest Mangal Pandey, but the Jemadar refused. The whole regiment, with the single exception of a soldier called Shaikh Paltu, drew back from restraining or arresting Mangal Pandey. Shaikh Paltu restrained Pandey from continuing his attack. 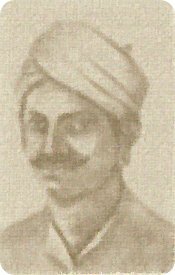 Mangal Pandey, after failing to incite his comrades into an open and active rebellion, tried to take his own life by placing his musket to his chest, and pulling the trigger with his toe. He only managed to wound himself, receiving a court-martial on April 6. British authorities hung him on April 8. The British courts sentenced the Jemadar Ishwari Prasad to death, hanging him on April 22. The British disbanded the regiment, taking their uniforms. Shaikh Paltu received promotion to the rank of Jemadar in the Bengal Army. Fires broke out in Agra, Allahabad and Ambala in April. At Ambala General Anson, Commander-in-Chief of the Bengal Army, judged that a riot over the cartridges loomed. He allowed the soldiers to tear the cartridges with their fingers rather than their teeth. Rather than remain at Ambala, Anson then departed for Simla, the cool "hill station" where many high officials spent the summer. Later in April, arsons set on fire barracks and European officers' bungalows. An 1858 photograph of a mosque in Meerut where some of the rebel soldiers may have worshiped. Another large military cantonment sat in Meerut, stationing 2,357 Indian sepoys and 2,038 British troops with 12 British-manned guns. On April 24, the commanding officer of the 3rd Bengal Light Cavalry ordered 90 of his men to parade and perform firing drills. All but five of the men on parade refused to accept their cartridges. On May 9, the British military court martialled the remaining 85 men, most receiving ten-year prison sentences with hard labor. Eleven younger soldiers received five years' imprisonment. The entire garrison stood in formation to witness the condemned men stripped of their uniforms and placed in shackles. As they marched off to jail, the condemned soldiers berated their comrades for failing to support them. The next day, Sunday, Indian soldiers warned British officers of plans to release the imprisoned soldiers by force, but they took no action. In Meerut, protests erupted in the bazaar, with some buildings set on fire. In the evening, the Indian troops, led by the 3rd Cavalry, broke into revolt. They killed British junior officers who attempted to quell the first outbreaks, attacking British officers' and civilians' quarters. Four civilian men, eight women and eight children died in the riot. Crowds in the bazaar attacked the off-duty soldiers there. The sepoys freed their 85 imprisoned comrades from the jail, along with 800 other prisoners (debtors and criminals). Some sepoys (especially from the 11th Bengal Native Infantry) escorted British officers and women and children to safety before joining the revolt. Some officers and their families escaped to Rampur, where they found refuge with the Nawab. Sepoys killed about 50 Indian civilians, some officers' servants who tried to defend or conceal their employers. Major General Hewitt, the commander of the division (nearly 70 years old and in poor health), reacted slowly. British troops and two European-manned batteries of the Bengal Artillery rallied, but received no orders to engage the rebellious sepoys. They could only guard their own headquarters and armories. When, on the morning of May 11 they prepared to attack, the rebels had marched off to Delhi. The first parties of the 3rd Cavalry reached Delhi that same morning. During the day, the revolt spread, rioters attacking British officials and dependents, Indian Christians and shop keepers within the city. They killed as many as 50 in a courtyard outside the King's palace..
Three battalions of Bengal Native Infantry stationed in or near the city. Some detachments quickly joined the rebellion while others held back but also refused to obey orders to take action against the rebels. In the afternoon, a violent explosion in the city was heard for several miles. Fearing that the arsenal, which contained large stocks of arms and ammunition, would fall intact into rebel hands, the nine British Ordnance officers there had opened fire on the sepoys, including the men of their own guard. When resistance appeared hopeless, they blew up the arsenal. Although six of the nine officers survived, the blast killed many in the streets and nearby houses and other buildings. Many fugitive British officers and civilians had congregated at the Flagstaff Tower on the ridge north of Delhi, where telegraph operators sent news of the rioting to other British stations. Aware that no help could arrive, they made their way in carriages to Karnal. Villagers helped some stragglers, while robbing or murdering others. The next day, Bahadur Shah held his first formal court for many years. The King felt alarmed by the open rioting, but eventually gave his support to the rebellion. The news of the events at Delhi spread rapidly, sparking uprisings in many districts. Learning of the fall of Delhi by telegraph, many British administrators hastened to remove themselves, their families and servants to places of safety. At Agra, 160 miles from Delhi, more than 6000 civilians converged on the Fort,  leaving the area in haste. Some British officers trusted their sepoys, but others tried to disarm them to forestall uprisings. At Benares and Allahabad, the disarming went poorly, resulting in local revolts. Although rebellion became widespread, rebels had little unity. Bahadur Shah Zafar restored to the imperial throne. But another faction wanted the Maratha rulers enthroned. The Awadhis also wanted to retain the powers that their Nawab used to have. Muslim leaders like Maulana Fazl-e-Haq Khairabadi including the millenarian Ahmedullah Shah, issued calls for jihad. Muslim artisans especially called for jihad. In Awadh, Sunni Muslims opposed a return to Shiite rule. They often refused to join an apparently Shia rebellion. Some Muslims like the Aga Khan supported the British. The British rewarded him by formally recognizing his title. The Mughal emperor, Bahadur Shah, resisted those calls. In Thana Bhawan, the Sunnis declared Haji Imdadullah their Ameer. In May 1857 the Battle of Shamli took place between the forces of Haji Imdadullah and the British. The Sikhs and Pathans of the Punjab and North-West Frontier Province supported the British and helped in the recapture of Delhi. Fifty-four of the Bengal Army's 75 regular Native Infantry Regiments rebelled. Some immediately broke up with their sepoys returning to their homes. The British disarmed or disbanded almost all the remainder prevent rebellions. All ten of the Bengal Light Cavalry regiments rebelled. The Bengal Army also included 29 Irregular Cavalry and 42 Irregular Infantry regiments. Those included a contingent from the recently annexed state of Awadh, which rebelled en masse. Another contingent from Gwalior also rebelled, even though that state's ruler remained allied to the British. The remainder of the Irregular units came from a wide variety of backgrounds, rendering them less affected by the concerns of mainstream Indian society. Three Gurkha and five of six Sikh infantry units, and the six infantry and six cavalry units of the recently-raised Punjab Irregular Force, actively supported the British. On April 1, 1858, the number of Indian soldiers in the Bengal army loyal to the British stood at 80,053. That total included a large number of soldiers hastily raised in the Punjab and North-West Frontier after the outbreak of the Rebellion. The Bombay army had three mutinies in its 29 regiments while the Madras army had no mutinies, though elements of one of its 52 regiments refused to volunteer for service in Bengal. Most of southern India remained passive with only sporadic and haphazard outbreaks of violence. Most of the states remained on the sidelines in the war as the Nizams or the Mysore royalty ruled many parts of the region independent of British rule. Bahadur Shah Zafar proclaimed himself the Emperor of the whole of India. That proclamation turned the Sikhs of Punjab away from the rebellion. They refused to return to Islamic rule, having fought many wars against the Mughal rulers. The province of Bengal remained quiet for the most part throughout the entire period. Initially, the Indian soldiers pushed back Company forces, capturing several important towns in Haryana, Bihar, Central Provinces and the United Provinces. The British received reinforcements and began to counterattack. The sepoys lacked a centralized command and control system. Natural leaders such as Bakht Khan looked for leadership to rajahs and princes. Some of those proved dedicated leaders, while others acted ineptly or with self-interest. Rao Tularam of Haryana and Pran Sukh Yadav fought with the British Army at Nasibpur. They went to collect arms from Russia which had just been in a war with the British in the Crimea, but died on the way. To a tribal leader from Peshawar's offer to help, the king rejected his offer citing an empty treasury and uncontrollable army. The British struck back slowly at first. Britain sent troops from the England to India by sea, moved some troops overland through Persia from the Crimean War, and diverted some regiments en route for China to India. The British organized troops already in India into field forces, two columns departing Meerut and Simla. Two months after the first outbreak of rebellion at Meerut, the two forces met near Karnal. The combined force (which included two Gurkha units serving in the Bengal Army under contract from the Kingdom of Nepal), fought the main army of the rebels at Badli-ke-Serai, driving them back to Delhi. The British established a base on the Delhi ridge to the north of the city and the Siege of Delhi began, lasting from July 1 to September 21. The encirclement left gaps, the British outnumbered by superior numbers. The rebels found bring supplies and reinforcements through the siege easy. For several weeks, disease, exhaustion and continuous sorties by rebels from Delhi tested the British forces. Outbreaks of rebellion in the Punjab failed, allowing the Punjab Movable Column of British, Sikh and Pakhtun soldiers under John Nicholson to reinforce the besiegers on the Ridge on August 14.On 30th of August the rebels offered terms, rejected by the British. Hindu Rao's house in Delhi, now a hospital, was extensively damaged in the fighting. Bank of Delhi was attacked by mortar and gunfire. The Jantar Mantar observatory in Delhi in 1858, damaged in the fighting. An eagerly-awaited heavy siege train joined the British force. From September 7, siege guns battered breaches in the walls and silenced the rebels' artillery. The British stormed the city through the breaches and the Kashmiri gate on September 14, gaining a foothold within the city with heavy losses, including John Nicholson. After a week of street fighting, the British reached the Red Fort. Bahadur Shah had already fled to Humayun's tomb. The British had retaken the city. The British arrested Bahadur Shah, British officer William Hodson commanding his sons Mirza Mughal, Mirza Khizr Sultan, and grandson Mirza Abu Bakr shot at the Khooni Darwaza (the bloody gate) near Delhi Gate. When the news reached zafar, he became speechless. His wife zinat mahal reportedly seemed thrilled to learn that news as now her real son would succeed the throne. Shortly after the fall of Delhi, the British organized a column which relieved a besieged British force in Agra, and then pressed on to Cawnpore, which had also recently been recaptured. That gave the British a continuous, although still tenuous, line of communication from the east to west of India. the British erected the memorial(circa 1860) after crushing the Mutiny at the Bibi Ghar Well. After Independence, the Indian government moved the statue to the Memorial Church, Cawnpore. Albumen silver print by Samuel Bourne, 1860. In June, sepoys under General Wheeler in Cawnpore, (now known as Kanpur) rebelled and besieged the European entrenchment. Wheeler, a veteran and respected soldier, had married a high-caste Indian lady. He had relied on his own prestige, and his cordial relations with the Nana Sahib to thwart rebellion, and took comparatively few measures to prepare fortifications and lay in supplies and ammunition. The British endured three weeks of the Siege of Cawnpore with little water or food, suffering continuous casualties to men, women and children. On June 25 Nana Sahib made an offer of safe passage to Allahabad for the besieged British. With barely three days' food rations remaining, the British agreed provided they could keep their small arms and that the evacuation should take place in daylight on the morning of the 27th (the Nana Sahib wanted the evacuation to take place on the night of the 26th). Early in the morning of June 27, the British party left their entrenchment and made their way to the river where boats provided by the Nana Sahib waited to take them to Allahabad. Mutineers killed several sepoys loyal to the British. Sepoys reportedly hacked to death several injured British officers trailing the column. After the main British party had arrived at the dock, sepoys positioned with clear lines of fire surrounded them. When firing broke out, crews abandoned their boats set on fire with red hot charcol. The British party tried to push the boats off but all except three remained stuck. One boat with over a dozen wounded men initially escaped, but later grounded. Mutineers pushed the boat back down the river towards the carnage at Cawnpore. Towards the end, rebel cavalry rode into the water killing survivors. After the firing ceased, the rebels survivors rounded up the men and shot them. All men had been killed while taking the women and children hostage. Only four men escaped alive from Cawnpore on one of the boats, among them Captain Mowbray Thomson, who wrote a first-hand account of his experiences entitled The Story of Cawnpore. The rebells took the surviving women and children to the Nana Sahib, confining them first to the Savada Kothi and then to the home of Sir George Parker (the Bibigarh). Later refugees from Fatehgarh joined them. Overall, five men and 206 women and children were confined in the Bibigarh for about two weeks. Twenty-five died from dysentry and cholera the first week. A British relief force that had advanced from Allahabad defeating the Indians. By July 15 the Nana Sahib decided to kill the hostages. Using knives and hatchets, the rebells hacked all the women and children to pieces They threw dead and injured down a nearby well until full, throwing the rest into the Ganges. 1858 picture of Sati Chaura Ghat on the banks of the Ganges River, where on 27 June 1857 many British men lost their lives and the rebels took prisoner the surviving women and children. Bibigurh house and well where rebells killed European women and children, 1858. The Bibigurh Well site where a memorial had been built. Samuel Bourne, 1860. The British public, horrified by the slaughter, unified against Indian rebels. "Cawnpore" became a war cry for the British and their allies for the rest of the conflict. The Nana Sahib disappeared near the end of the Rebellion, never to resurface. Very soon after the events in Meerut, rebellion erupted in the state of Awadh (also known as Oudh, in modern-day Uttar Pradesh). The province had been annexed barely a year before. The British Commissioner resident at Lucknow, Sir Henry Lawrence, had enough time to fortify his position inside the Residency compound. The British forces numbered some 1700 men, including loyal sepoys. The rebels' initial assaults proved unsuccessful. They began a barrage of artillery and musket fire into the compound. Lawrence stands as one of the first casualties. The rebels tried to breach the walls with explosives and enter by way of underground tunnels, leading to underground close combat. After 90 days of siege, only 300 loyal sepoys, 350 British soldiers and 550 non-combatants remained. On September 25, a relief column under the command of Sir Henry Havelock fought its way from Cawnpore to Lucknow, defeating the numerically superior rebel forces. Known as 'The First Relief of Lucknow', Havelock's force failed to break the siege, joining the garrison under seige. In October another, larger, army under the new Commander-in-Chief, Sir Colin Campbell, relieved the garrison. On the November 18, they evacuated the defended enclave within the city, the women and children leaving first. They then conducted an orderly withdrawal to Cawnpore, where they defeated an attempt by Tatya Tope to recapture the city in the Second Battle of Cawnpore. Sir Henry Montgomery Lawrence British Commissioner of Oudh who died during the siege of Lucknow. Secundra Bagh after the slaughter of 2000 Rebels by the 93rd Highlanders and 4th Punjab Regiment. Albumen silver print by Felice Beato, 1858. Early in 1858, Campbell once again advanced on Lucknow with a large army, seeking to suppress the rebellion in Awadh. A large Nepalese contingent advancing from the north under Jang Bahadur aided Campbell. Campbell's advanced slowly and methodically, driving the large but disorganized rebel army from Lucknow while sustaining few casualties. A large numbers of the rebels dispersed into Awadh, compelling Campbell to spend the summer and autumn dealing with scattered pockets of resistance while losing men to heat, disease, and guerrilla actions. When war broke out, Jhansi quickly became a center of the rebellion. A small group of British officials and their families took refuge in Jhansi's fort, and the Rani negotiated their evacuation. When they left the fort, the rebels broke faith massacring them. The Jhansi Fort, which was taken over by rebel forces, and subsequently defended against British recapture by the Rani of Jhansi. 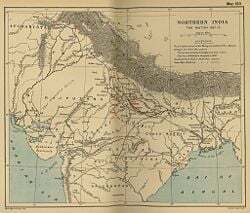 By the end of June 1857, the British had lost control of much of Bundelkhand and eastern Rajastan. The Bengal Army units in the area, having rebelled, marched to take part in the battles for Delhi and Cawnpore. The many Princely States making up this area began warring amongst themselves. In September and October 1857, the ruler, Rani, led the successful defense of Jhansi against the invading armies of the neighboring rajas of Datia and Orchha. In March 1858, the Central India Field Force, led by Sir Hugh Rose, advanced on and laid siege to Jhansi. The British captured the city, Rani fleeing in disguise. After being driven from Jhansi and Kalpi, on June 1, 1858 Rani Lakshmi Bai and a group of Maratha rebels captured the fortress city of Gwalior from the Scindia rulers, British allies. That might have reinvigorated the rebellion but the Central India Field Force very quickly advanced against the city. The Rani died on June 17 during the fighting. The British recaptured Gwalior within the next three days. In descriptions of the scene of her last battle, some commentators compared Rani to Joan Of Arc. Colonel Henry Durand, the then British resident at Indore, had brushed away any possibility of uprising in Indore. On July 1st, sepoys in Holkar's army revolted and opened fire on the pickets of Bhopal Cavalry. When Colonel Travers rode forward to charge, Bhopal Cavalry refused to follow. The Bhopal Infantry also refused orders and instead leveled their guns at British sergeants and officers. Since all possibility of mounting an effective deterrent had been lost, Durand rallied the British residents for a successful escape, although 39 British residents of Indore died. The inhabitants of the Punjab had less sympathy for the sepoys than their home regions. That thwarted the intensity of uprisings by regiments of sepoys. At the most important garrison, Peshawar close to the Afghan frontier, the British intercepted the sepoys' mail, thus preventing their coordinating an uprising. They the "Punjab Movable Column" to move rapidly to suppress any revolts as they occurred. When it became clear from the intercepted correspondence that some of the sepoys at Peshawar planned to revolt, two British infantry regiments in the cantonment, backed by artillery disarmed four Bengal Native regiments on May 22. That decisive act induced many local chieftains to side with the British. Several regiments in frontier garrisons subsequently that rebelled became isolated among hostile Pakhtun villages and tribes. The British executed in mass several hundred rebelling or deserting sepoys in the Punjab and North West Frontier provinces during June and July. The British had been recruiting irregular units from Sikh and Pakhtun communities even before the first unrest among the Bengal units. Their numbers increased greatly during the Rebellion. At one stage, faced with the need to send troops to reinforce the besiegers of Delhi, the Commissioner of the Punjab suggested handing the coveted prize of Peshawar to Dost Mohammed Khan of Afghanistan in return for a pledge of friendship. The British Agents in Peshawar and the adjacent districts rejected the move. In the event Lord Canning insisted on Peshawar being held, and Dost Mohammed, whose relations with Britain had been equivocal for over 20 years, remained neutral. The final large-scale military uprising in the Punjab took place on July 9, when most of a brigade of sepoys at Sialkot rebelled and began to move to Delhi. John Nicholson intercepted them with an equal British force as they tried to cross the Ravi River. Three days later, Nicholson annihilated the 1100 trapped sepoys in the Battle of Trimmu Ghat. Jhelum in Punjab also served as a center of resistance against the British. Thirty five British soldiers of HM XXIV regiment (South Wales Borderers), died on 7 July 1857. To commemorate that victory St. John's Church Jhelum was built and the names of those 35 British soldiers carved on a marble lectern present in that church. Kunwar Singh, the 75-year-old Rajput Raja of Jagdishpur, instigated and assumed the leadership of revolt in Bihar. On 25th of July, rebellion erupted in the garrisons of Dinapur. The rebels quickly moved towards the cities of Arrah, joined by Kunwar Singh and his men. Mr. Boyle, a British engineer in Arrah, had already prepared his house for defense against such attacks. As the rebels approached Arrah, all British residents took refuge at Mr. Boyle's house. A siege soon ensued and 50 loyal sepoys defended the house against artillery and musketry fire from the rebels. From the end of 1857, the British had begun to gain ground again. They retook Lucknow in March 1858. The last rebels defeated in Gwalior on June 20, 1858, the waring parties signed a peace treaty on July 8, 1858 ending the war. By 1859, rebel leaders Bakht Khan and Nana Sahib had either been slain or had fled. As well as hanging mutineers, the British had some "blown from cannon"—an old Mughal punishment adopted many years before in India. A method of execution midway between firing squad and hanging, the British stood sentenced rebels before the mouth of cannons and blew them to pieces. The Indians suffered significantly higher casualties. The rebellion saw the end of the British East India Company's rule in India. In August, the Government of India Act 1858, formally dissolved the company, ruling powers over India transferring to the British Crown. Essentially the old East India Company bureaucracy remained, though with a major shift in attitudes. The lack of consultation between rulers and ruled had been seen as a significant factor in contributing to the uprising. Justice, a print by Sir John Tenniel in a September 1857 issue of Punch. Bahadur Shah Zafar exiled in Rangoon. Photograph by Robert Tytler and Charles Shepherd, May 1858. Acting on that sentiment, Lord Ripon, viceroy from 1880 to 1885, extended the powers of local self-government and sought to remove racial practices in the law courts by the Ilbert Bill. Militarily, the rebellion transformed both the "native" and European armies of British India. ↑ "Memorandum from Lieutenant-Colonel W. St. L. Mitchell (CO of the 19th BNI) to Major A. H. Ross about his troop's refusal to accept the Enfield cartridges, February 27, 1857," Archives of Project South Asia, South Dakota State University and Missouri Southern State University. Retrieved July 18, 2009. ↑ G. B. Malleson. The Indian mutiny of 1857. (original 1891)(New Delhi: Asian Educational Services, 2006). ↑ Christopher Hibbert. The Great Mutiny. (London: Allen Lane, 1978), 73-74. ↑ Interview with historian William Dalrymple,Indian mutiny was 'war of religion', Sept. 6, 2006, BBC. Retrieved July 18, 2009. ↑ Hamid Hussain, The Story of the Storm—1857, Defence Journal. ↑ Zachary Nunn, "The British Raj". ↑ B.H. Marat, The Indian Army: 1765 - 1914. ↑ God's Acre. The Hindu Metro Plus Delhi. October 28, 2006. ↑ Mowbray Thomson and R. Clay. The story of Cawnpore. (London: Richard Bentley, New Burlington Street, 1859), 148-159. ↑ John William Kaye. A history of the Sepoy war in India, 1857-1858. . books.google. ↑ Memoirs of Charles John Griffiths. gutenberg.org. ↑ McLeod Innes. The Sepoy revolt: A Critical Narrative. (London: A.D. Innes & Co. 1897), books.google. all links Retrieved July 18, 2009. Allen, Charles. Soldier Sahibs: The Men Who Made the North-west Frontier. Abacus, New ed., 2001. ISBN 0349114560. Bandyopādhyāẏa, Śekhara. From Plassey to partition: a history of modern India. New Delhi: Orient Longman, 2004. ISBN 9788125025962. Bose, Sugata, and Ayesha Jalal. Modern South Asia: history, culture, political economy. New York: Routledge, 2004. ISBN 9780415307864. Brown, Judith M. 1994. Modern India: the origins of an Asian democracy. The Short Oxford history of the modern world. Oxford, England: Oxford University Press. ISBN 9780198731122. Dalrymple, William. The Last Mughal: The Fall of a Dynasty. Delhi, 1857. Bloomsbury Publishing, 2007. ISBN 0747587264. David, Saul. The Indian Mutiny: 1857. London: Viking, 2002. ISBN 9780670911370. Fremont-Barnes, Gregory. The Indian Mutiny, 1857-58. (Essential histories, 68). Oxford: Osprey Pub., 2007. ISBN 9781846032097. Hibbert. Christopher. The Great Mutiny: India 1857. London: Allen Lane, 1980. ISBN 0140047522. Hibbert, Christopher. The Great Mutiny: India 1857. Harmondsworth [etc. ]: Penguin Books, 1986. OCLC 66044978. Holmes, Richard. Sahib: the British soldier in India, 1750-1914. London: HarperCollins, 2005. ISBN 9780007137534. Metcalf. Thomas R. The Aftermath of Revolt: India, 1857-1870. Riverdale Co. Pub., 1991. ISBN 8185054991. Mukherjee. Rudrangshu. Awadh in Revolt 1857-1858: A Study of Popular Resistance. Delhi: Oxford University Press, 1984. ISBN 9780195615845. Roy, Tapti. The politics of a popular uprising: Bundelkhand 1857. Delhi: for the Oxford University Press, 1994. ISBN 9780195636123. Stanley, Peter. White Mutiny: British Military Culture in India, 1825-1875. London: Christopher Hurst & Co., 1998. ISBN 9781850653301. Stokes. Eric. Bayly, C. A., ed. The Peasant Armed: The Indian Revolt of 1857. Oxford: Clarendon Press, 1986. ISBN 0198215703. Taylor, P. J. O. What really happened during the mutiny: a day-by-day account of the major events of 1857 - 1859 in India. Delhi: Oxford University Press India, 1999. ISBN 9780195651133. White, Michael. Lachmi Bai, Rani of Jhansi: the Jeanne d'Arc of India. New York: J.F. Taylor, 1901. OCLC 7354128. Wood, Evelyn. 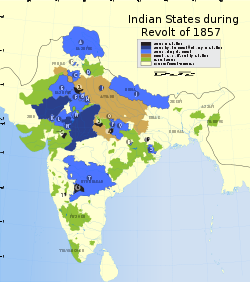 The Revolt in Hindustan 1857-59. London: Methuen, 1908. Innes, McLeod. The Sepoy revolt: A Critical Narrative. London: A.D. Innes & Co. 1897. Malleson, G. B. The Indian mutiny of 1857. (original 1891) New Delhi: Asian Educational Services, 2006. ISBN 9788120620063. Pandey, Sita Ram. (1873). From Sepoy to Subedar, Being the Life and Adventures of Subedar Sita Ram, a Native Officer of the Bengal Native Army, Written and Related by Himself, trans. Lt. Col. Norgate, (Lahore: Bengal Staff Corps,), ed. James Lunt. Delhi: Vikas Publications, 1970. OCLC 108707. Wilberforce, Reginald G. An Unrecorded Chapter of the Indian Mutiny, Being the Personal Reminiscences of Reginald G. WIlberforce, Late 52nd Infantry, Compiled from a Diary and Letters Written on the Spot. (original 1884. London: John Murray), facsimile reprint: Gurgaon: The Academic Press, 1976. OCLC 3512946. Truth behind 1857 part I in The Panthic Weekly panthic.org. Truth behind 1857 part II War of Independence? Paintings related to events of 1857. In Pictures: Rare images of the 1857 uprising in India, BBC News. 12th May 2007. History of "Indian Rebellion of 1857"
This page was last modified on 1 March 2018, at 22:05.